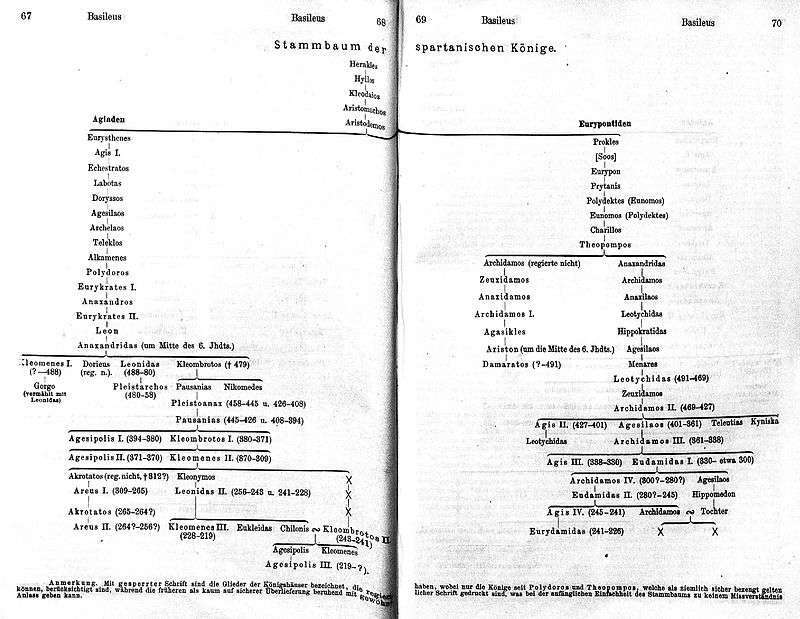 This list of kings of Sparta details the important rulers of the Greek city-state of Sparta in the Peloponnesus. Sparta was unusual among Greek city-states in that it maintained its kingship past the Archaic age. It was even more unusual in that it had two kings simultaneously, called Archagetai,[n 1] coming from two separate lines. According to tradition, the two lines, the Agiads and Eurypontids, were respectively descended from the twins Eurysthenes and Procles, the descendants of Heracles who supposedly conquered Sparta two generations after the Trojan War. The dynasties themselves, however, were named after the twins' grandsons, the kings Agis I and Eurypon, respectively. The Agiad line was regarded as being senior to the Eurypontid line. Although there are lists of the earlier purported Kings of Sparta, there is little evidence for the existence of any kings before the middle of the 6th century BC or so. Spartan kings received a recurring posthumous hero cult like that of the Dorian kings of Cyrene. The kings' firstborns sons, as heirs apparent, were the only Spartan boys expressly exempt from the Agoge, however they were allowed to take part if they so wished, and this endowed them with increased prestige when they ascended the throne. The ancient Greeks named males after their fathers, producing a patronymic by infixing -id-; for example, the sons of Atreus were the Atreids. In the case of royal houses the patronymic formed from the founder or an early significant figure became the age of the dynasty. A ruling family might in this way have a number of dynastic names; for example, Agis I named the Agiads, but he was a Heraclid, and so were his descendants. In cases where the descent was not known or was scantily known the Greeks made a few standard assumptions based on their cultural ideology. A people was treated as a tribe, presumed to have descended from an ancestor bearing its name. He must have been a king, who founded a dynasty of his name. This mythologizing extended even to place names. They were presumed to have been named after kings and divinities. Kings often became divinities, in their religion. The Lelegid were the descendants of Lelex (a back formation), ancestor of the Leleges, a Pelasgian tribe inhabiting the Eurotas valley before the Greeks, who, according to the mythological descent, amalgamated with the Greeks. The Lacedaemonids contain Greeks from the age of legend, now treated as being the Bronze Age in Greece. In the language of mythologic descent, the kingship passed from the Leleges to the Greeks. The Atreidai (Latin Atreidae) belong to the Late Bronze Age, or Mycenaean Period. In mythology these were the Perseides. As the name of Atreus is attested in Hittite documents, this dynasty may well be proto-historic. The Spartan kings as Heracleidae claimed descent from Hercules, who through his mother was descended from Perseus. Disallowed the Peloponnesus, he embarked on a life of wandering. They became ascendant in the Eurotas valley with the Dorians who, at least in legend, entered it during an invasion called the return of the Heracleidae; driving out the Atreids and at least some of the Mycenaean population. c. Theras (regent) son of Autesion and brother of Aristodemos' wife Argeia;[n 2] served as regent for his nephews, Eurysthenes and Procles. The dynasty was named after its second king, Agis. c. 900 – 870 BC Echestratus Expelled the Cynurensians[n 4] that were in power. The dynasty is named after its third king Eurypon. Not shown is Lycurgus, the lawgiver, a younger son of the Eurypontids, who served a brief regency either for the infant Charilaus (780–750 BC) or for Labotas (870–840 BC) the Agiad. c. 890 BC Soos[n 7] Son of Procles and father of Eurypon. c. 780 – 750 BC Charilaus Ward, pupil, and nephew of the Spartan reformer Lycurgus; War with the Argives and destroyed the border-town of Aegys; Battle of Tegea. c. 750 – 725 BC Nicander First Messenian War begins. 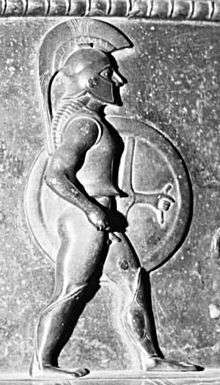 c. 725 – 675 BC Theopompus Second Messenian War begins. c. 575 – 550 BC Agasicles Contemporary with Leonidas I; End of the Messenian Wars. c. 550 – 515 BC Ariston Battle of the Fetters. c. 515 – 491 BC Demaratus Greco-Persian Wars begins. c. 427 – 401 BC[n 8] Agis II Spartan hegemony; Attacked Epidaurus, Leuctra,[n 9] Caryao, Orchomenos, and Mantinela; Invaded the Argolis; Council of war[n 10] formed to check his powers. c. 227 – 221 BC Eucleidas Actually an Agiad; installed by Cleomenes III[n 11] in place of Archidamus V.
Following Cleomenes III's defeat against Antigonus III Doson of Macedon and the Achaean League in the Battle of Sellasia, the Spartan system began to break down. Sparta was a republic from 221 to 219 BC. The dual monarchy was restored in 219 BC. The Achaean League annexed Sparta in 192 BC. ↑ Greek: ἀρχαγέται, archagétai, plural of ἀρχαγέτας, archagétas, Doric form of ἀρχηγέτης, archēgétēs. ↑ A Cadmid of Theban descent. ↑ According to Apollodorus of Athens. ↑ Cynuria is said to have been colonized by Cynurus; Cynurensian bandits were common in the lands. ↑ Agesilaus II, distinguished king of Sparta, being asked which was the greater virtue, valor or justice, replied: "Unsupported by justice, valor is good for nothing; and if all men were just, there would be no need of valor". ↑ Of Sous is related an anecdote, which, though it manifest great patience and resolution, contains one of those deceptions which Cicero justly censures as inconsistent with integrity of mind. Being surrounded by his enemies in a spot where his army suffered very severely for want of water, he made a treaty with them, promising to restore all the places he had taken from them, on condition that he and all his men should drink of a spring at a small distance from the camp. Which treaty being ratified, he first endeavoured by the offer of no less a reward than his kingdom to prevail on some one of his soldiers to refrain from drinking; but when they all refused, he himself only sprinkled some water on his face, and then, as not having drunk, refused to perform the stipulated condition of restoring the places which he had taken: thus by a base evasion depriving his enemies of the benefit to which they were entitled by permitting him and his army to have access to the fountain to drink, if they would. 1 2 Or 427 – 400 BC. ↑ And again, after the Carnean festival. ↑ Consisting of 10 Spartans. ↑ Hall, Johnathan. A History of the Ancient Greek World. Blackwell. ↑ ἀρχαγέτας, ἀρχηγέτης. Liddell, Henry George; Scott, Robert; A Greek–English Lexicon at the Perseus Project. ↑ Cartledge, Paul, The Spartans, Vintage Books, 2003. ↑ Pindar and the cult of heroes. By Bruno Currie Page 245 ISBN 0-19-927724-9. ↑ A Classical Dictionary By John Lemprière. Pg 618. ↑ A Prosopography of Lacedaemonians, Part 396. By Alfred S. Bradford. Page 44. ↑ Edward William Whitaker. A Complete System of Universal History, Volume 1. 1821. Pg 417. ↑ Plutarch's Lives: Marcus Crassus.-Sertorius.-Eumenes.-Agesilaus.-Pompeius. By Plutarch. The Cyclopædia, Volume 20. By Abraham Rees. Page 157+ (List of kings of Sparta on pg. 164). Sir William Smith, A New Classical Dictionary of Greek and Roman Biography, Mythology, and Geography: Partly Based Upon the Dictionary of Greek and Roman Biography and Mythology. Harper & Brothers, 1851. Sir William Smith. Abaeus-Dysponteus. J. Murray, 1890. Sir William Smith. A Dictionary of Greek and Roman Biography and Mythology: Earinus-Nyx. J. Murray, 1876. William Smith (Ed.) A Dictionary of Greek and Roman Biography and Mythology: Oarses-Zygia. J. Murray, 1880.